Arthritis is one of the most commonly diagnosed medical conditions in the United States, especially among senior citizens. According to the CDC, there are more than 50 million such cases in the United States alone, a number than includes almost half of all adults older than 65. One thing you may not know: arthritis comes in many different forms. The word “arthritis” simply refers to any type of joint pain, and there are dozens of different specific types and conditions, which cause different types of pain or even deformity in different parts of the body. Osteoarthritis: Protective cartilage and fluid inside a joint slowly wear down after years of ordinary wear and tear, leading to increased friction from bones rubbing against one another. Post-Traumatic Arthritis: It’s similar to osteoarthritis, but related to a specific traumatic injury rather than ordinary wear and tear. It may not present until years after the original accident. Rheumatoid Arthritis: The body’s immune system mistakenly attacks the lining in the joints, leading to chronic pain and inflammation, and potentially permanent joint damage and deformity. Gout: When the body isn’t able to filter uric acid out of the blood stream quickly enough, the excess acid forms crystals that painfully lodge themselves in a joint, often the big toe, causing sudden flare-ups of intense pain. Fibromyalgia: An imbalance in the chemical transmitters used by nerves to communicate signals may significantly increase the brain’s sensitivity to pain, often in and around joints. Other symptoms may include fatigue, inability to concentrate, and mood swings. Other conditions, while not always categorized as arthritis, may mimic arthritis symptoms or cause pain in joints in addition to other systems—for example, lupus, an autoimmune disorder that can cause symptoms similar to rheumatoid arthritis in addition to affecting other systems. 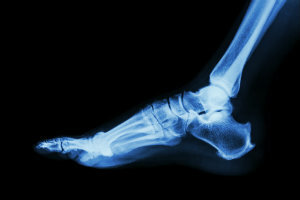 Whatever the source of your foot and ankle joint pain, Dr. Harvey Danciger in Palm Desert can help. With the latest tools, tech, and training, he helps people like you every day overcome their joint pain and lead the healthiest, most active, and most pain-free lives possible. Although most cases of arthritis are not “curable,” a variety of conservative therapies, medications, laser treatments, lifestyle modifications, or surgery may significantly improve symptoms and mobility. To schedule an appointment, please use our online form or give us a call at 760-568-0108.